Michael Cox has been in the wine business for twenty hears, the last twelve of which as winemaker at Schug Winery in Carneros. He is a University of California at Davis graduate in enology and viticulture with success in working with multiple varietals, but his professed passion is Pinot Noir. His wife, Tina, is a wine veteran, as well, having worked in marketing at Robert Mondavi. Together, they started Mayro-Murdick Wines. The name Mayro-Murdick comes from the distinctive first names of their paternal grandfathers. Michael and Tina realized back in 2002 that many wine drinkers needed a go-to decent Pinot Noir that was affordable enough to serve as a can be found for $15 or less. Michael found a 35-year-old vineyard in the Santa Lucia Highlands planted to a gamay clone of Pinot Noir on its own roots and crafts a wine using microoxygenization labeled Hunterdon (see Hunterdon). 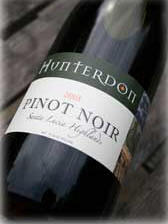 The inspiration for Hunterdon comes from the crus of southern Burgundy, where producers age their wines in large casks which naturally introduces miniscule amounts of oxygen into the casks to soften and mature the wine. This controlled introduction of oxygen is known as "micro-oxidation". We believe this winemaking technique allows the true varietal character of Pinot Noir--stunning cherry fruit--to shine while maintaining a touch of the earthiness that Pinot fans love. 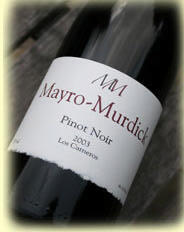 A second Pinot Noir bottled under the Mayro-Murdick label, is a more serious wine vinified in a more traditional manner. Sourced primarily from Iund Vineyard in Carneros, it is priced significantly more but delivers more layered complexity and interest. Both wines are sold on the website.